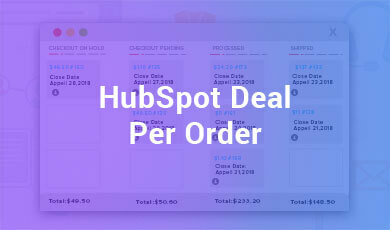 HubSpot Deal Per Order allows you to convert the individual potential sale of your store to HubSpot Deal with lots of details regarding the deal. It is the easiest way to track your store’s overall sales and revenue generated throughout the month or a specified time period. The best thing regarding the deals that HubSpot allows is to track them individually with the attached contacts and associated revenue. HubSpot Deal Per Order setup and creates a new WooCommerce Sales Pipeline and custom Deal groups and properties. 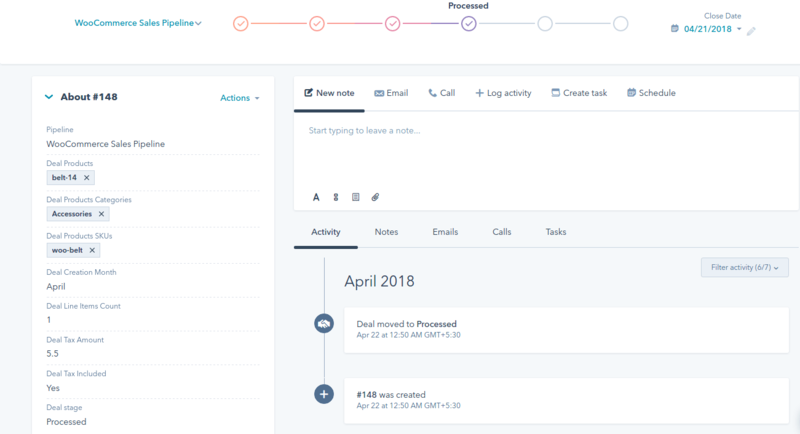 WooCommerce Sales Pipeline uses different deal stages for the orders with the winning probability assigned to all. Converts each and every order of your e-commerce store to HubSpot Deal with appropriate deal-stage, amount and closing date. Auto-updates the deals on HubSpot whenever any order status is changed or updated. Allows exporting old orders of your store to HubSpot as deals just in a single click. It assigns the well-defined stage to the deals according to their current status on the store as an order. Extra Details regarding the products involved in the deal can be easily tracked with the HubSpot Deal Per Order. NOTE: For using HubSpot Deal Per Order, firstly you need to install and activate parent plugin HubSpot WooCommerce Integration Pro. 1) Download the zip folder of the plugin HubSpot Deal Per Order. Manual installation of the plugin is another option to install the plugin to your WordPress-environment. The manual installation method involves downloading our HubSpot Deal Per Order Extension and uploading it to your web server via your favorite FTP application. 1) Upload the HubSpot Deal Per Order plugin folder to the /wp-content/plugins/ directory. 2) Activate the Add-on through the Plugins menu in WordPress. 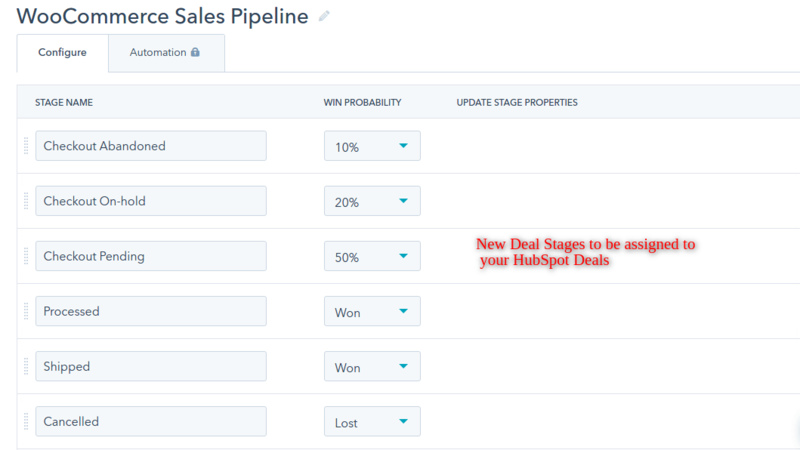 Using deal stages, you can categorize and track the progress of the deals that you’re working on in HubSpot. Each deal stage has a probability associated that indicates the likelihood of closing deals marked with that deal stage. Enabling the add-on and saving the settings will show up the options to set up the new pipeline for HubSpot Deals. Setup a new pipeline with the help of this extension. The new pipeline is “WooCommerce Sales Pipeline”. Now the last step is to set up the custom group and properties for HubSpot Deals. This will be required to store additional details regarding the deals on HubSpot such as product names, categories, SKUs and much more. The new pipeline for HubSpot Deals will be as displayed below. It will contain different deal stages which will be assigned to deals on new order creation. After the activation and full setup of add-on, whenever a new order will be placed on your store it will be converted to Deal on HubSpot. The deals can be easily managed through “Board View” of Deals in HubSpot. Each HubSpot deal will contain lots of information regarding the order on your store. The details will generally include the pipeline, deal-stage, amount, products purchased, products categories, product SKUs, deals savings, deal creation month, deal line items count etc. Deal name: “#” with the prefix to order number. Deal Closing Date: same date for orders with processing and completed status but for orders other than these statuses we add 7 days more to the closing date. Deal Products Purchased: details of all the products purchased for the order. Deal Products SKUs: details of product SKUs. Deal Product Categories: details of categories for products purchased. Deal Creation Month: the current month when the deal is created. Deal Subtotal Amount: subtotal of order. Deal Savings Amount: discounted amount such as by applying coupon. Deal Tax included: indicates whether the tax was included in the current deal or not. It will be “Yes” or “No”. Deal Tax Amount: tax amount of the order. Deal Line Items Count: order items count for purchased products. 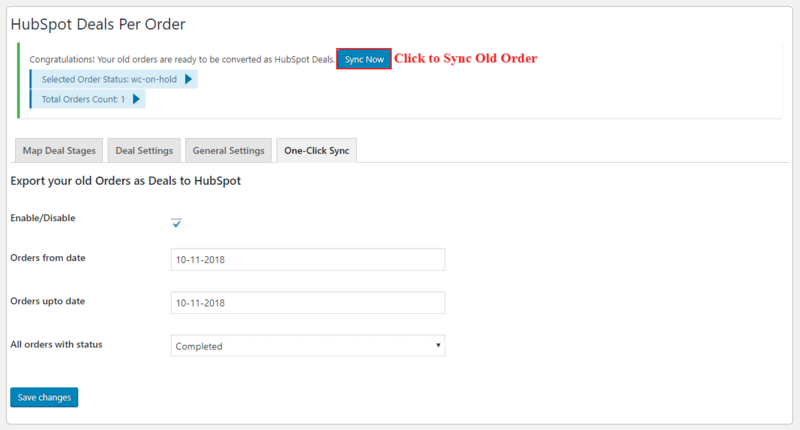 Using of General Setting, you can easily update the deals custom properties on HubSpot just by clicking on the update button. 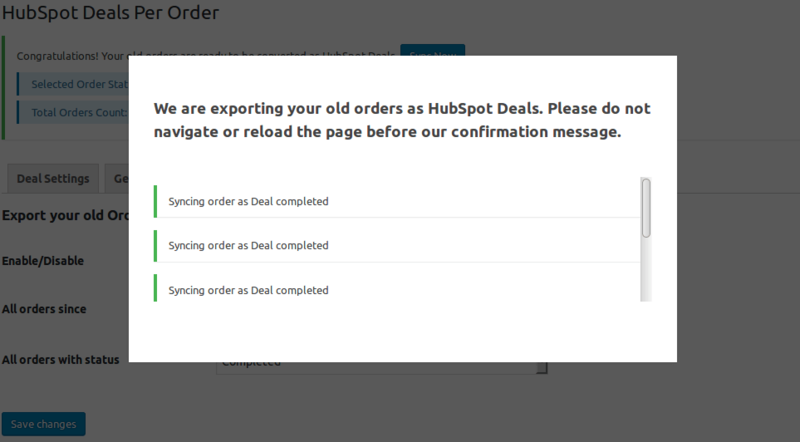 Enable this feature to export all your previous/old orders to HubSpot as the deal. Set the date and select the preferred order status. All orders since the selected date and selected status will be fetched for the exporting process. You can also see the total count for orders according to set you have saved for one-click sync feature. Now just click the “Sync Now” button and you will see the one by one exporting of orders on HubSpot as deals. Here is how your orders will be syncing to HubSpot in the deals section.